The basic idea behind preferential etching is to mark defects intersecting the surface by a small pit or groove, so they become visible in a microscope. Find an etching solution that dissolves your material much more quickly around defects than in perfect regions (that is the tricky part). and surface structure after preferential etching of defects. After preferential etching you obtain well developed etch pits (actually something looking more like pointed etch cones) at the intersection points of dislocations (including partial dislocations) and the surface and etch grooves at the intersection line of grain boundaries and stacking faults with the surface. Precipitates will be shown as shallow pits with varying size, depending on the size of the precipitate and its location in the removed surface layer. Areas with high densities of very small precipitates may just appear rough. Two-dimensional defects as grain boundaries and stacking faults may be delineated as grooves. There is a certain problem with grain boundaries, however: They may also be delineated, i.e. rendered visible, with chemicals that do not preferentially etch defects, but simply dissolve the material with a dissolution velocity that depends on the grain orientation (this is the rule and not the exception for most chemicals). In this case grain boundaries show up as steps and not as grooves. Small steps and grooves, however, look very similar in a light microscope and may easily be mixed up. Grain boundaries separating two grains with similar orientation with respect to the surface would not be revealed. The delineation of grain boundaries obtained under uncertain etching conditions suggests that you delineated all defects - but in fact you did not. Delineation of grain boundaries thus must not be taken as an indication that the etching procedure works and there are no defects, because you don't see any! Nobody knows how to mix a preferential etching solution for some material from theoretical concepts. Of course you must look for chemicals or mixtures of chemicals that react with your material, but not too strongly. But after this bit of scientific advice you are on your own in trying to find a suitable preferential etch for your material. Well-established preferential etching solutions usually have unknown and poorly understood properties. They sometimes work only on specific crystallographic orientations; their detection limits for small precipitates are usually unknown; they may also depend on other parameters like the doping level in semiconductors; and so on. 2. Defect etching in practice is more art then science. Beginners, even under close supervision by a master of the art, will invariably produce etched samples with rich structures that have nothing to do with defects - they produced so-called etch artifacts. It takes some practice to produce reliable results. But: Defect etching still is by far the most important and often most sensitive technique for observing and detecting defects! There are many routine procedures for delineating the defects structure of metals by etching. Here we will focus on defects etching in Silicon; which is still the major technique for defect investigations in Si technology. Some details and peculiarities of defect etching in Si can be found in the link. In what follows we look at the power and possible mechanisms of preferential etching in the context of examples from recent research. The name "Swirl defects" was used for grown-in defects in large Si crystals obtained by the float-zone technique in the seventies. Swirl defects are a subspecies of what now is known as "bulk micro defects" (BMD); they are nothing but agglomerates of the point defects present in thermal equilibrium near the melting point with possible influences of supersaturated impurities still present in ultra clean Si (only oxygen and on occasion carbon). Whereas the relatively large swirl defects are no longer present in state-of-the-art Si crystals, point defect agglomerates and oxygen precipitates still are - there is no way to eliminate the equilibrium defects! BMDs are a major concern in the Si industry because they cause malfunctions of integrated circuits. The link leads to some recent papers on point defects and BMDs in Si crystals. Most of the examples relating to Si are taken from the work of B.O. Kolbesen (formerly at Siemens; now (2001) at the University of Frankfurt). The name "swirl" comes from the spiral "swirl-like" pattern observed in many cases by preferential etching as shown on the right. Understanding the precise nature of swirl defects was deemed to be very important for developing crystal growth techniques that could avoid these detrimental defects. But etching alone can not give structural data, and other techniques as, e.g., transmission electron microscopy, could not be applied directly because the densities of swirl defects was too small (the likelihood of having a defect in a typical TEM sample was practically zero). A combination of a special etching technique and TEM, however, could give the desired results. The power and the "black art" component of defect etching is nicely demonstrated by the following development: A "special etch" which was simply the old solution, but cooled to about freezing temperatures, did not produce etch pits (and thus remove the defect) for A-swirls, but hillocks (still containing the defect). The hillocks identified the precise location of the A-swirl defect. A special preparation technique rendered the areas containing hillocks transparent for TEM investigations, and the structure of A-swirls defects could be identified. They consisted of dislocation loop arrangements that were generated by the agglomeration of interstitials. This gave the first direct evidence that self-interstitials are important in Si. B-swirl defects could not be identified with this technique - their nature is still not clear. More about swirl defects and the application of preferential etching can be found in an original paper (in German) in the link. The manufacture of integrated circuits (IC) involves many processes prone to introduce defects in the more or less perfect starting crystal. All high temperature processes induce temperature gradients which lead to stress and thus to a driving force for plastic deformation. Since the starting material is dislocation free, the decisive process is the generation of the first dislocations which is much easier if small precipitates or dislocation lops are already present. Thermal oxidation introduces Si interstitials with a strong tendency to agglomerate into stacking fault loops, so-called oxidation induced stacking faults (OSF). All processes tend to induce trace amount of metals which will diffuse into the Si and eventually precipitate. Ion implantation destroys the lattice to a large degree up to complete amorphization. Even upon careful annealing some defects may be left over. As a general rule, all defects in the electronically active part of an IC (roughly the the first 5 µm - 10 µm of the wafer) are deadly for the device. They have to be avoided and that means that they have to be monitored first. The method of choice is preferential etching. The pictures show a Si wafer with several defect types introduced during very early stages of processing. Details are provided in the link. A few more example are provided in the links. They might be a bit unconvincing, but be aware that looking into an actual microscope gives you much more information than what can be captured in a few pictures. One last example serves to illustrate the "what you see must be interpreted" point. 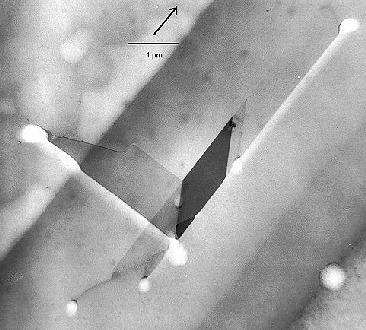 Shown is a complex defect composed of stacking faults, dislocations and possibly a microtwin in full splendor in a TEM micrograph (left), and a schematic outline of what the preferential etching would look like in an optical microscope. The planar defects are inclined in a thin foil; what one sees is the projection. One surface was preferentially etched; at the intersection of the defect with this surface the etch features can be seen as bright areas (the sample thickness is smaller at etched parts). The stacking fault lines will be clearly visible in an etch picture, but the various dislocations involved are etched with different strengths. It will not be possible to conclude from the etch pattern alone on the complexity of the actual defect. This stacking fault assembly corresponds to some extent to the etch pattern shown in the development of stacking faults in bipolar patterns given in the link. Chemical etching, as any chemical dissolution process, is an oxidation-reduction process expressed in chemical terms. Carriers are transferred from the substrate to the chemicals, new compounds form and go into solution. The paradigmatical model for these processes is anodic dissolution under applied bias, where the carriers are supplied by a controlled external power source. Maybe a way towards the understanding of preferential etching comes from the electrochemistry of the specimen? Bias the (p-type) Si sample positively in some electrolyte that contains hydrofluoric acid (HF). The HF itself is "contacted" by some inert electrode, e.g. a Pt wire, which establishes a closed circuit. The Si-HF- junction behaves to some extent like a Schottky junction; current flow, however, is always accompanied by a chemical reaction. The current density first increases steeply with the applied bias, then reaches a maximum (called jPSL; PSL stands for "porous Si layer") and decreases again (that is when the analogy with a Schottky junction fails), goes through a second maximum (called jox) and finally starts to oscillate . In the "forward" regime of the junction, the reaction is the dissolution of Si (in reverse condition it is H2 evolution). If a polished specimen that was subjected to a current density considerably smaller than the first peak value is inspected after some etching time, its defect will be revealed in a way reminiscent of purely chemical etching. This can be understood (in parts) by considering current flow in terms of diffusion current and generation currents as introduced in basic pn- (or Schottky)-junction theory. The major ingredients for anodic etching are shown below. and generation currents. Around a defect the generation current is larger than in perfect Si. The consideration of the influence of defects on a Schottky junction suggests a different approach to the detection of electronically active defects: Measure the local leakage current or radiation induced current of a junction. This can be done by injecting current locally by an electron beam through a thin Schottky barrier while measuring the induced current. Electronically active defects will recombine more carriers than the defect-free regions, the current will be locally reduced. This method exists and is called "electron beam induced current" technique (EBIC) if a scanning electron microscope is used as the basic instrument. If a scanned light beam is used, we have the "light beam induced current" technique or LBIC; the mainstay of solar cell development with poly crystalline Si. The principle of EBIC is shown in the link. Anodic etching is still a virulent research issue within the context of the general electrochemistry of semiconductors.